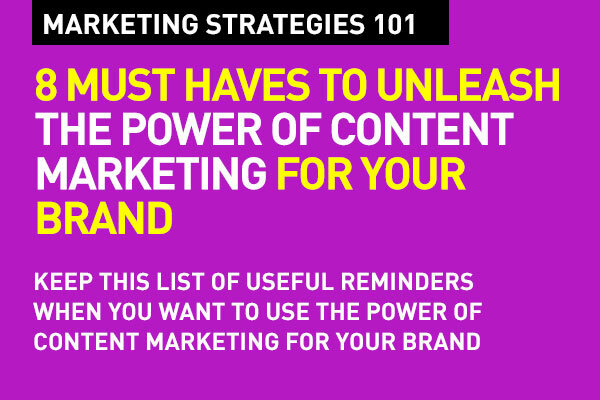 Content has to be useful for your target audience. No matter how well its written, if it doesn't solve a problem or provide an answer, it's meaningless. Every piece of content you create should be useful. That's how you get good following and people look forward to your content. Providing value, providing resolution to a need is what good content is all about. You can't do that without knowing your audience. Then you need to focus your content aimed at the audience you want to reach and engage. You really need to figure you what they want and deliver on that. Make it useful for them. Not you. READ THIS LATER: Start with the right consumer insights. 3. Don't sell. Educate. Entertain. Selling is secondary. Good content marketing focuses on sharing information, on educating, on entertaining, on engaging. Your goal is to educate your audience on how to solve a problem and who to reach out to for help. If readers or viewers want to know how to remove a carpet stain, they should know how to do so by the end of the article or video. 4. Be an Expert. Make content must-have. You really need to come off as the go-to source for information that will add value to the audience. You need to be the expert they turn to. You can't do that without being the authority on what you write about. Get experts to create content if you or your content teams can't do it right. Remember that you can't be an expert on everything, so select your topics carefully. Your topics should always show how much you know, and that the content really is the best they can find. Your content is great when it has lasting value. Evergreen content is anything that provides a basic overview of a topic or provides information that is just as true years from now as it is today. Remember content has a long tail, it is going to be around, and people will find it via Search down the road, if you've done your homework – and they'll find it useful whenever. Content, which is about a current topic or trend does have its purpose, but it disappears from the value chain if it is specific to only a band of time. What does your content want to achieve? Are you building a brand? Selling a product. Every piece of content should have a goal – a result you want – an action that you want your audience to take, or something that the reader will remember. The power of content marketing sees it working full force when it resonates with the contexts of social media. remember that you may have a very useful blog, but people usually discover your content via social media. Make sure you distribute your content (provide links, mentions, posts) across the various social media channels that are appropriate for your audience. Know how to tailor content distribution for Twitter, Facebook, and other social sites. Doing so could increase the odds of readers finding out about you or what you have to sell by finding your social media pages as well. SEO is what will help drive traffic and help you better acquire a following. SEO is more than just using keywords or phrases. Use key words and phrases consistently throughout your page, which includes using them in title tags and in paragraph headings. Overall, make sure your content is great content. Not just anything that your audience can stumble across just about anywhere else. Be consistent in style. Check for typos and grammar. If in video, make sure the quality is the best around. Go HD. And remember to provide usefulness and meaning each and every time. That's something fundamental to content. The value. The usefulness. And that's the basics. That's Digital Marketing Strategies 101. Please share this with your colleagues and friends. This is an important list to keep handy. 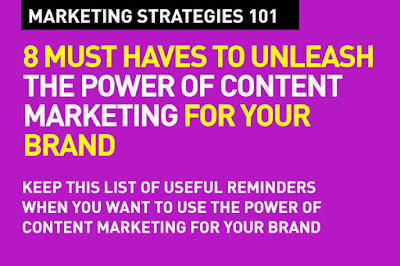 Very nice list of points that all good content marketing people should remember. What also needs to be added is that content today is mostly on social media, so that is important. Been following your blog. Very good articles. This is a very useful piece on the relevance of getting content marketing done the right way. Very important points. Thank you. Increase response rates and return on investment by selecting our highly targeted and verified Australia B2B Email Lists of prospects from our business.